Kloos with a late goal. 5-3 UW. 54.8 left. Minnesota scores a power-play goal to make it 5-3 with 54.8 to go. GOPHERS GOAL: Kloos one-times a pass from Sheehy to make it 5-3 UW with 54.8 seconds left. #Gophers goal! Captain Kloos makes it a 5-3 game with 54.8 seconds to play. Single assist to Tyler Sheehy. Minnesota pulls their goalie. 30 seconds left. Schierhorn out of the net with 36 seconds left. Badgers ice it with 30.1 left. FINAL: Wisconsin beats No. 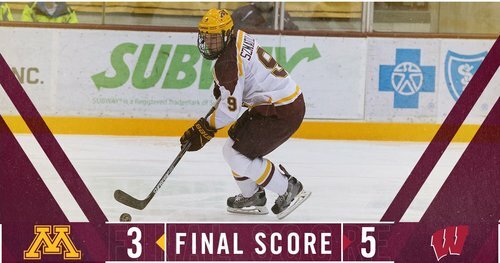 7 Minnesota 5-3. 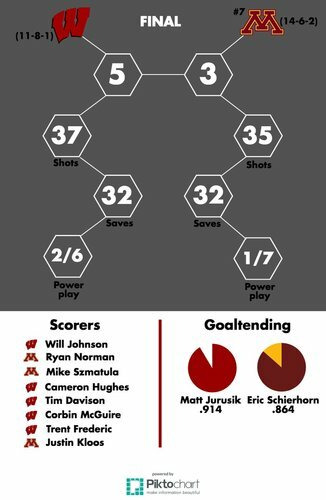 Gophers' win streak ends at 7, unbeaten streak at Kohl Center ends at 5 (4-0-1).
.@BadgerMHockey defeats Minnesota for the first time in three years, 5-3. Shots on goal end up 37-35 for the Badgers. Jurusik and Schierhorn both end up with 32 saves. The Badgers improved to 7-0-1 after a loss with their 5-3 victory over Minnesota. Minnesota coach Don Lucia: "You get what you earn. We didn't earn a win tonight." Correction to earlier tweet: Beat Minnesota at home for first time in 3 years. They did win in Minneapolis once last year.